Fantasy Trade Advice - Jason Witten for Kyle Rudolph? Thanks for using our fantasy football trade evaluator! I strongly prefer the Keenan Allen / Kyle Rudolph side of this deal. T.Y. Hilton is as explosive as it gets in todays NFL but he is so inconsistent. I have always been the amongst the strongest supporters of Jason Witten as a draft day value but his time in the sun is drawing near. KYle Rudolph is now teamed up with Norv Turner in Minnesota and we have all seen what he did with Antonio Gates in his hay day. I think you definitely gain at WR and you take a small gamble at tight end. If Rudolph blows up like he should you will not be able to get him at this price ever again. Best of luck in 2014! Drop by any time for unlimited fantasy football trade advice! Fantasy Football Trade Analyzer - Sell the Farm to get Peyton Manning? Thanks for using our fantasy football trade analyzer! I would pass on that deal, I just dont think you gain enough to warrant giving up Marshall, Witten and Stafford (i've written off MJD) Would love to get my hands on Peyton Manning but not at this price. Best of luck in week 6! Write in anytime for unlimited fantasy football trade advice! When Should I Draft A Fantasy Quarterback in 2013?? To really get my point across here we are going to withhold the names of the players until the end of this article. In the mean time we will simply refer to these three players as players as player A, B and C. Let's dive right into it! In 2012 Player A averaged 324 passing yards per game. Players B was close behind him averaging 306 passing yards per game and player C averaged 268 passing yards per game. In 2012 player A had 670 pass attempts. Player B had 648 pass attempts and Player C had 565 pass attempts. With those pass attempts in mind; player B had the best completion percentage with a 65.6 success rate. Player A was next at 63 percent. Player C wasn’t too far behind with a 61.1 percent completion rate. The major difference with these 3 players would be touchdowns which we all know can vary from year to year depending on a number of factors (Matthew Stafford went from 41 touchdowns down to 20 touchdowns from 2011 to 2012!) Player A led the pack with 43 touchdown passes. Player B comes in second with 28 touchdown passes and Player C brought up the rear with 22 total passing touchdowns. I do realize these numbers are somewhat far apart but believe me, we’ll get to that. The final stat is rather important as it usually pertains to negative points in standard fantasy football leagues; interceptions. There may be a direct correlation between pass attempts and interceptions but player C led this category (which is a good thing) with 15 interceptions in 2012. Players A and B tied with 19 interceptions a piece in 2012. Now take a close look at those numbers and more importantly those rankings. Touchdowns aside Tony Romo is not far behind Drew Brees in a good number of those statistical categories even besting Drew Brees in completion percentage. It is true that Drew Brees had a good number of touchdown passes compared to Tony Romo but stayed focused on the point of this article; fantasy football draft value. In order to even think about getting Drew Brees as your starting fantasy quarterback you are going to have to grab him before the 4th round in almost every standard fantasy football league. In comparison Tony Romo is currently going as late as the 7th round in mock drafts. Now I am not saying you should draft Tony Romo over Drew Brees nor am I saying that the touchdowns do not matter. I am simply saying that across the board the only thing separating these two fantasy quarterbacks at great length is the number of touchdowns. Tony Romo clearly has the opportunity to throw more touchdowns, which has been made clear by his number of pass attempts. Half of fantasy football is a gamble; you are gambling that a certain player will outperform another player based on his position on draft day. It is unlikely that Tony Romo will outperform Drew Brees in 2013 but he does have the supporting cast around him to shine (Dez Bryant, Miles Austin and Jason Witten make up one of the league’s top receiving corps) and the numbers are close enough for me to take that gamble and grab another highly coveted skill position player on draft day. Fantasy football is all about value and risk/reward! The third round (which is where you will have to grab Drew Brees) has been yielding players like Jimmy Graham, Montee Ball, Darren Mcfadden, Randall Cobb and Larry Fitzgerald. Larry Fitzgerald is a monster and a former first round fantasy football draft pick, which leads me to player C - Carson Palmer. Carson Palmer is now paired with Larry Fitzgerald in Arizona. That potentially dynamic duo is also paired with Bruce Arians. Bruce Arians is the same pass happy play caller that had Andrew Luck (a rookie in 2012) slinging the rock to the tune of 4,374 passing yards with 23 touchdowns. I realize that Carson Palmer’s 2012 numbers do not hold up against Drew Brees or Tony Romo but look at the supporting casts. Tony Romo had Jason Witten, Dez Bryant and Miles Austin. Drew Brees had Jimmy Graham, Marques Colston, Lance Moore and Darren Sproles. Poor Carson had Denarius Moore, Darrius Heyward-Bey and Rod Streater. That trio is pedestrian at best compared to the likes of Larry Fitzgerald, Michael Floyd and Andre Roberts. Carson Palmer is currently going as late as the 16th round in mock drafts. If you want to draft a quarterback in the first three rounds of your fantasy draft you go right ahead, after all it is your fantasy football team. Someone like Drew Brees is sure to produce high octane fantasy numbers, but will your team be lacking elsewhere? I would rather roll with two quarterbacks from later rounds and retain my top 3 draft selections for skill positions with slimmer options heading into this season. If you go with the two players above one of them is likely to pan out. The moral of the story is spending a top 3 pick on a fantasy quarterback just is not necessary in 2013; there is far better value to be had in later rounds. Still not sure which fantasy quarterback to target in 2013? Check out our 2013 preseason quarterback rankings or feel free to write in seven days a week for free fantasy football draft advice! Trade Jimmy Graham for Arian Foster? PPR league, I'm weak at Running Back and have been starting Jimmy Graham and Jason Witten as Tight End and Flex. Should I trade Jimmy Graham for Arian Foster? Thanks for writing in. That’s a tough one to answer without seeing just how weak you really are at running back. As of this writing both Tight ends have been PPR gold. Witten has 82 receptions and Jimmy Graham has 55; that’s a lot of points to give up but you really could gain a lot by getting the best and most reliable running back in the game with Arian Foster (who has caught 25 passes himself) I really have no problem pulling the trigger on that one since you would be retaining the more valuable PPR Tight end in the deal and getting the best running back possible. Aside from the Pittsburgh match up, there is nothing scary about the cowboys upcoming schedule, in fact it's rather inviting! I would be curious to see your running back depth though so feel free to write back when you get a moment. Best of luck in week 13! Write in as much as you like for free fantasy football trade advice! his role. If you own any of these guys you are starting them, that is all there is to it. On the flip side expect bi g things from the Dallas offense as well more specifically in the passing game. Dez Bryant and Miles Austin are coming into the game with some injury concerns but both have been officially listed as probable and should play the full clip of snaps tonight. Demarco Murray has a lot to prove tonight and very well could make a statement tonight. I get the feeling Demarco Murray will get somewhere near 75-90 yards with a score giving his owners a nice fantasy football outing. Jason Witten should be sitting this one out with a lacerated spleen. Expect big things from both quarterbacks tonight but let’s not forget historically offenses start out slowly in their first game back in real action. Temper expectations in the first half but expect fireworks in the second half. How Valuable is Jimmy Graham? I am in a keeper league and about to begin the 5th season. Would you trade Jason Witten (who has a 4year contract) in a PPR league for Jimmy Graham (who has no contract). I am hesitant because Witten is typically a top-5 Tight end and that is one less position to draft for the next 3 seasons. However, I have Drew Brees this year and may consider tagging Graham if I make the trade. I run a Yahoo league, with our scoring system Graham is projected 15 pts higher for the entire season. What are your thoughts? Dustin. Thanks for writing in. This is a tough scenario but you really cannot go wrong. Without knowing your league’s keeper limitations ( I am assuming contracts transfer between owners) I would say make the deal. Jimmy Graham is a rare talent with seemingly limitless upside while Witten is a rock solid, consistent veteran possibly nearing the down slope of his career. I do not believe Witten will suffer any sort of down turn in 2012. 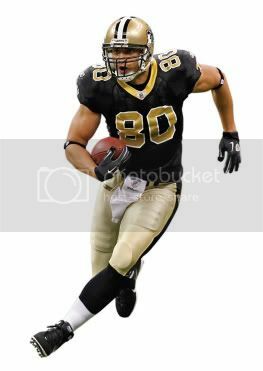 I am sure he will be amongst the top tight ends in any scoring format for at least two more years, but if you have the opportunity to get a young superstar like Jimmy Graham you must make that deal happen. If the other owner has put the trade offer on the board, stop what you are doing and go accept that deal! If you are contemplating making that offer I would expect a counter. I realize both players are amongst the top tight ends in the league but if I owned Jimmy Graham, I would need proper compensation and a Jason Witten alone simply wont get it done. The fact that Graham is so talented and so young gives him added value in your type of league. I would certainly try my best to land Graham, but If the other owner is asking to much simply walk away and enjoy another top five season from your trusty tight end. Lets face it; you don’t really need to upgrade your tight end, you are enamored by Jimmy Graham’s upside! Hope this helps! Feel free to write in anytime for unlimited fantasy football trade advice! I'm in a serious keeper league and this year we've already had our fantasy draft. I picked up Jimmy Graham with my second first round pick. The commissioner of my league is very focused on getting him from me. He is offering Jason Witten who has 2 years left as a keeper and Marques Colston for him. What are your thoughts? Thanks for writing in. When offering fantasy football trade analysis, one of the most important factors to consider is the overall structure of the teams in question. Jimmy Graham is obviously an absolute stud but Jason Witten is no slouch either. Amongst fantasy tight ends, Witten finished 3rd in yardage, 6th in receptions and fifth in targets. His one glaring flaw was the fact that he only amassed 5 touchdowns in 2011. However, lets not be so quick to forget Jason Witten was fantasy football's top tight end in 2010. The potential is clearly there. The question here is who are your starting wide receivers? If Colston would provide a boost to your wide receiving corp. this would be a good opportunity to improve your team across the board while still maintaining a strong value at the tight end position. Speaking of value, Jimmy Graham's value will never be greater than it is right now. You might shoot for the moon and go after that elusive "fantasy football trade blockbuster" The other owner may be willing to throw in a more valuable receiver! This is a very strong offer, it is clear the other owner means business. That said, unless you need help at wide receiver or the opposing owner wants to kick it up a notch and throw in a top 8 wide receiver, I would pass. Jimmy Graham and all his points are too valuable to give up unless you need help or the offer is too good to pass on. Hope this helps! Feel free to write in any time for unlimited, FREE fantasy football trade advice!